Worried about the performance of your marine battery? Well, the performance of a battery doesn’t depend only on its quality or how you use them, but also how you charge them. So you must have a marine battery charger that suits your battery. After researching for many hours to find the marine battery charger for my kayak, I realize that it would be very convenient if I buy a three bank marine battery charger. Because you may need to charge all of your 3 batteries. In that case, it’ll be tough to charge them manually one after another. With 3-bank marine battery charger, you’ll be able to charge all of them at the same time. During my research, I found any one of these batteries can be the perfect match for your vessels according to their requirement. So to pick the right one, you can follow the detail of my top 5 list and the specification of a good 3 bank marine charger. Buying a 3 bank charger ensures you that all your batteries receive a proper charge and also gets well- maintained after they get fully charged to ensure efficiency; as these bank chargers helps your batteries get through the winter and be prepared for action when spring comes. Below are top 5 boat battery charger reviews to help. 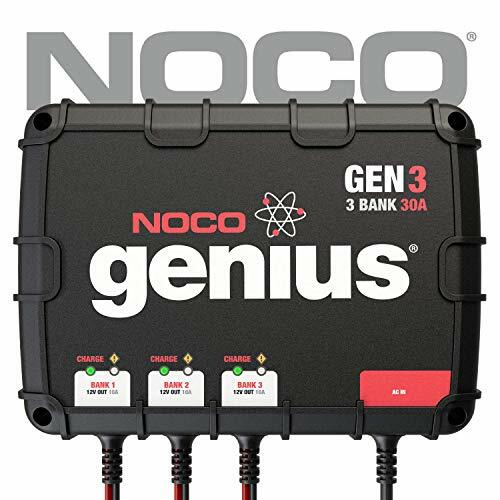 This boat battery charger by NOCO offers not only a three bank portal, but also gives a mix of a high- technology in a rugged construction presentation to offer an efficient and effective charging experience to you. It is waterproof which ensures no electric dysfunction just in case it suddenly gets watered on, and protects its electricity wiring. It also automatically adjusts itself to the amount of energy your battery needs and can take to avoid over charging or short- circuiting, and can charge two times faster than a regular charger but still provides high- efficiency even for lightweight batteries. It is rated IP68 which helps protect your unit from extreme environments. 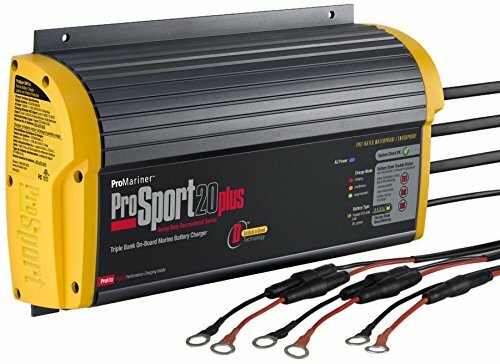 The Pro Mariner is a heavy duty one of the best 3 bank marine battery charger which is a part of the Pro Sport series charger, wherein its generation of chargers incorporates an all- digital microprocessor control. It also provides an automatic installation to lessen the difficulty on your part. With the Pro Sport series being incorporated with a distributed- on- demand charging technology, it takes the available charging amps and distributes it to where it is more needed for a faster charging time. It also helps your batteries to re- condition for both short- term and long-term storage time; and with its LED display indicator, you will know activities by your charger: charging, condition and an auto maintain mode is available. MK 330D is an On- Board battery charger by Minn Kota which is equipped with a digital processor with its microprocessor- based design will help in monitor your battery’s temperature and charging status. It also has an automatic multi-stage charging feature wherein the Minn Kota charger is in control of the amount of voltage and current your battery receives while charging and this is to ensure that your battery gets a precise and charge all throughout. This battery is also made of waterproof construction materials to help combat and shield your battery from vibrations and shock; plus it is also saltwater- tested to give you a full- round charging protection. 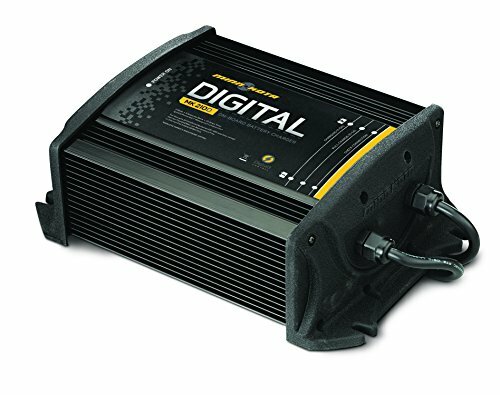 Dual Pro series is a three bank charger which provides a 15 amp each bank. This Professional series had been one of the known marine battery chargers to provide a safe, reliable and good performing chargers and helps in giving you a longer time in the water as they extend your battery’s life. It is equipped with a reverse polarity protection feature to ensure that your chargers are not hazardous or prone to shock, and also has a temperature control feature to help lessen tendencies of breakage at a certain temperature and allows only what your unit can handle. 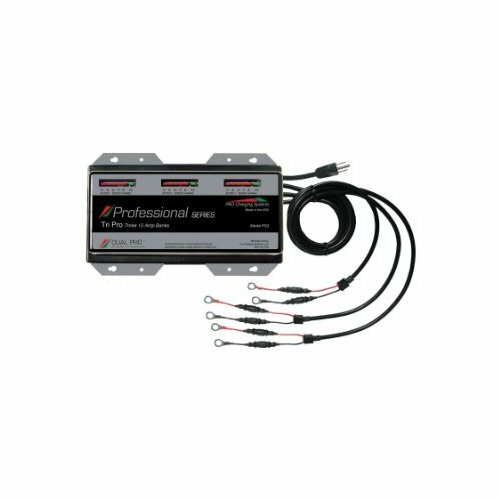 This marine battery charger is automatic and will prevent your batteries from being over- charged, and is waterproof wherein it provides a vibration and shock- resistant feature for the user. 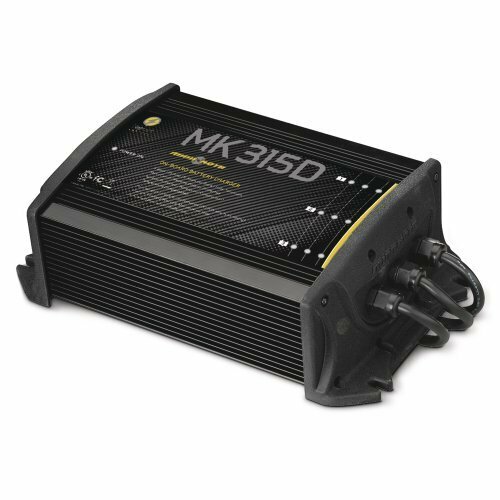 MK 315D is another best chargers for boats by Minn Kota, which has three banks per charger and is provided with about 5 amps per bank. It is saltwater- tested to help protect your charger from corrosion, and alongside this is its waterproof, shock and vibration- resistant features for a full- rounded charger protection. To deliver a full and efficient fast charging process, it has a true- rated feature; and with temperature levels affecting the charging process, it is equipped with an automatic temperature compensation feature wherein it can sense outside temperature changes and automatically adjusts the charge for more accurate charging. Having a boat or trolling for a hobby and interest is already quite the investment, particularly if you add further the accessories and other maintenance equipment that you will purchase to ensure that your activities last long and you get your money’s worth. You can follow a few basic steps to choose the right one. Choosing the right marine battery charger is one of the first things you have to decide on because you will be spending and you would want something you can use for a long time that will provide an efficient charging experience. This you can do by taking a look at various on-board battery charger reviews. 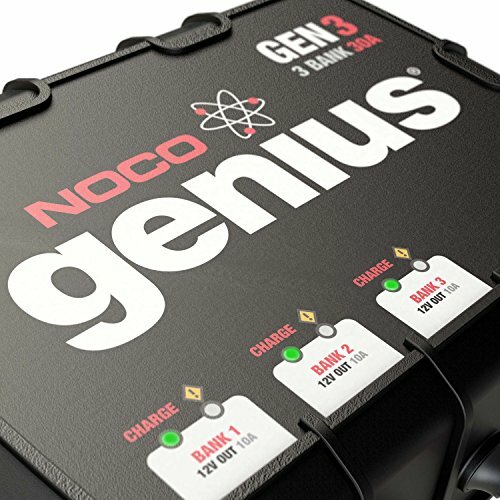 When choosing the best 3 bank marine battery charger for you, the first thing you must consider is the size of battery that you will need: it will depend on your boat’s source of AC power and what you need is a charger that can effectively provide you just about enough capacity to continuously run your battery system. Second, you may want to consider how long will it take for it to fully charge your batteries, ideally a good marine battery charger should be able to provide about 50 to 85 percent of battery charge once a day. Another thing to look for is whether or not the charger is equipped with a multi-stage smart charging system as this will help in providing a maximized efficiency in your charging system. Aside from lessening your hassle in changing batteries every complete charging process, the usage of a three bank marine battery charger has more benefits than you can probably consider before you choose and fully commit on a certain battery charge. First, it will help in prolonging your starting battery’s running life which in turn enables you to stay longer on the waters with two fully charged batteries as reserves. With the technology incorporated in these three bank chargers, you do not have to worry too much with over charging, temperature changes and even long storage times as they will be a good tool to help preserve and keep your batteries in tip top shape. It adjusts well more in different environmental conditions, and lessens chances of environmental caused dysfunctions. One of which is making it waterproof, and being saltwater- tested for further protection. Okay, for a simple instruction of how to handle these best portable marine battery chargers, you have to know and keep in mind a few reminders: for safety precautions as well. First and foremost, it is important that you ensure that the area around the battery is well- ventilated while it charges batteries. Make sure that all charging terminals are well- cleaned and to avoid any corrosion from having contact with your eyes. It is important that you always make sure that the extension cord is connected on the charger first before on the battery, this is observed as well when disconnecting after charge. Each battery charger comes with a manual for further specification on the brand’s extra maintenance procedure. Can I charge 4 batteries together if I hook them up together? ​Yes, you can. No problem at all. They are able to do that. Can I charge all 3 bank battery with it? ​Yes, you can. It is 3 bank battery charger and this is its job. Feel free. How long is the AC power cord? ​Basically a 3 bank charger has 6-8 feet long power cord. Do they work on golf cart batteries? ​Yes, if you use 12 Volts battery. Are they come with included cables? Choosing the right 3 bank marine battery charger for trolling motor battery of your boat is one of the crucial things you must decide on. Because it is the vital part of making your batteries run, hence the above marine onboard battery charger buying guide. There are a lot of considerations and features to consider before choosing which one is right for you and your needs. To buy the best one for your marine battery, simply find the answers about what you need. Then you can narrow down the products and find the one you needed. The brand is just a secondary factor, you must consider for trustworthiness and reliability for the best onboard battery charger for you. If you can purchase the right kind (size, features and capacity), it’ll save your time and energy and you’ll be able to complete your purpose of sailing.